By Andrew L. Johns. Lexington: The University Press of Kentucky, 2010. ISBN 978-0-8131-2572-5. Appendix. Notes. Bibliography. Index. Pp. vii, 339. $40.00. Vietnam’s Second Front is a cogent examination of the Republican Party’s roiling contribution to the tragic progression of the Vietnam War. This well-written book focuses specifically on how domestic political considerations shaped foreign policy decision-making from 1961 to 1973, and it drills into a divisive GOP environment with extensive and well-chosen research. Andrew Johns, a professor at Brigham Young University, explores the impact of domestic politics on the Vietnam War through a progression of eight chapters that chronologically reveal Hawk vs. Dove divisions within the GOP, its struggles with the Democratic administrations of John F. Kennedy and Lyndon B. Johnson, and how its decision-making and culpability in the war’s outcome pivoted on domestic political calculations. The administrations of Kennedy, Johnson and Richard M. Nixon shared contentious relationships with the GOP, (in Nixon’s case with specific members) that are closely examined throughout the book. Furthermore, they all shared a motivation to achieve only as much in the realm of foreign policy as their domestic agendas could withstand. For example, in 1963, Kennedy was quoted saying to a friend, “We don’t have a prayer of staying in Vietnam. Those people hate us. They are going to throw our asses out of there at almost any point. But I can’t give up a piece of territory like that to the Communists and then get the American people to re-elect me.” While Johnson and Nixon both vacillated on this theme, the goal of achieving aggrandizing domestic political ends over successful, viable foreign policy continues to disgust and astound. Johns’s research in dozens of archival collections substantiates his examination of the GOP and the calculations that shaped political decision-making concerning the Vietnam War. It provides a unique, although very frustrating, perspective on the Vietnam War which would make a positive addition to college faculties’ curriculum in both political science and history. For example, the source documents of personal letters between elected officials and constituents, among others, provide the reader with a street-level view. The emphasis on primary sources provides a lived-experience sensibility which underscores the efforts, and political hits that some politicians took to stand up for sincerely held beliefs. Senators, which include both Hawks and Doves, such as John Sherman Cooper (R-KY), Mark Hatfield (R-OR), Edward Brooke (R-MA), John Tower (R-TX), Pete McCloskey (R-CA), among others, stand out as voting, advising, and acting on their convictions. Others worked, unfortunately, for far less noble ends. The book is also a useful companion to military accounts of the war. While Johns’s work does not include the personal cost of the war, his very worthwhile study reinforces the tremendous sacrifices of military personnel and their families, as recorded in Franklin Miller’s Reflections of a Warrior. It also confirms the difficulties the Vietnam War posed for the Army as demonstrated in Andrew Krepinevich’s The Army and Vietnam. 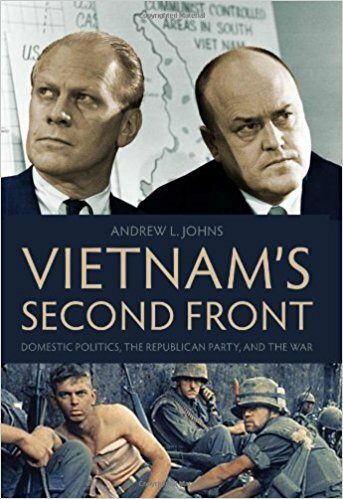 Johns’ work, in sum, powerfully demonstrates the Vietnam War’s political complexities and price, all of which was paid for by generations of Americans and Vietnamese.